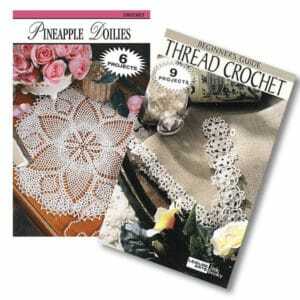 Here at Make It Crochet, I love crochet beauty and I write about it every single day. 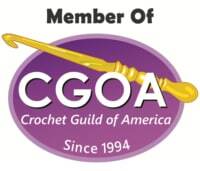 If you would like to be certain to get your daily dose of crochet beauty, please sign up for email notifications in the subscription box. I have always admired the work of Josi Hannon Madera. She is so precise and exact with her designing. She has the unique ability of designing real clothing for real people. And, I’m pretty certain that this extraordinary Spiderweb Skirt was the first design I saw by her. Just look at that twirling! It takes real skill to get such a beautiful photo! Josi has graciously made the Spiderweb Skirt pattern available free on Ravelry HERE, but please do yourself a favor and check out her Ravelry designer page HERE because you will not be disappointed. Here is a photo of the Spiderweb Skirt I made for my daughter. I wanted to use Red Heart Luster Sheen which is quite a bit smaller than the pattern but it turned out that no real changes were necessary to the pattern. I simply used a larger size and worked toward those instructions to make the size I needed for her. At Josi’s Ravelry storeHERE, you will find more crochet beauty, like this Marlena Ribbed Sweater. And, this amazing Raspberry Fizz Lace Cardigan HERE. Yes! Isn’t this positively gorgeous? Now, I know what you’re thinking. Oh, just look at all the ends I’ll have to weave in. Right? That’s what you’re thinking, isn’t it? Let’s not think like that. Let’s look at the amazing possibilities for this pattern. Let’s look at all the tiny bits and balls of scrap yarn lying around and let’s make some shapes! 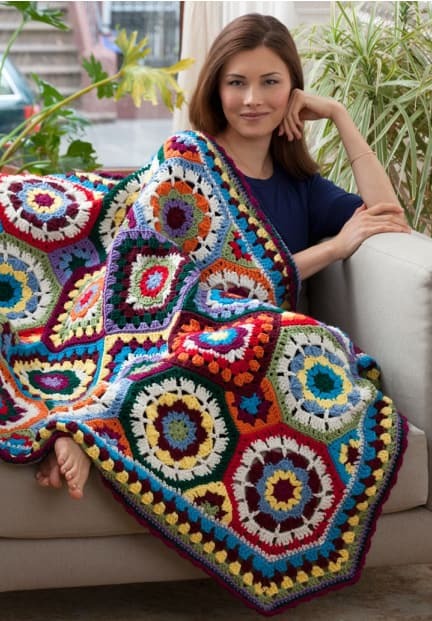 This entire afghan could be made with scraps alone. It’s positively wonderful! And, the end result? Well, that certainly doesn’t look like something that was made with scraps. Your project will look amazing! But, let’s get to the fun part. Guess what? 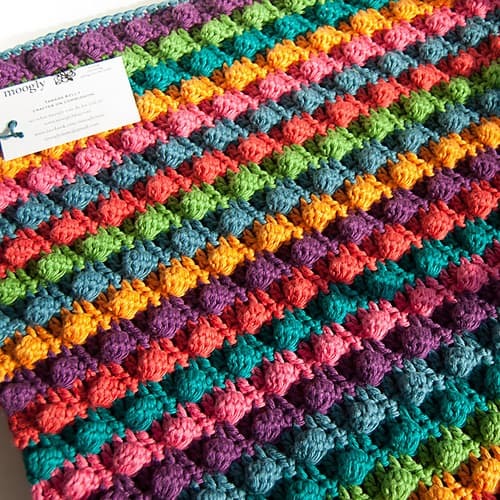 The designer of this dose of crochet beauty is Jessie of JessieAtHome.com. 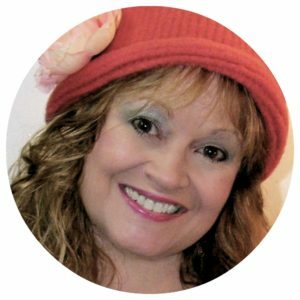 She’s made very thorough videos of every step of the process. The more I learn about Tamara Kelly, the more I like her. And, who can’t love a website called Moogly? Adorable! This is a really terrific blanket and would be great as full size as well. I remember when I did a blanket with a very similar stitch pattern for my first child. I received lots and lots of compliments on it and people inquiring about how to do it. Lucky for us, we now have Blackberry Salad and it’s FREE! Tamara used Lion Brand Cotton-Ease for this project, but the pattern is accommodating to just about any yarn you would like to use. Be prepared to use a bit more yarn than you would expect. You’ve got a solid blanket here, without holes, and, when you add the bobbles to the mix, you’re going to end up with more yardage than you might expect. Not a fan of changing colors manually? Great news for you! I was able to find some terrific projects made in Caron Cakes, Lion Brand Mandala and Premier Sweet Roll. Go ahead and explore with these hugely trending color block yarns. Tamara has graciously made this pattern available for free on her website HERE.